These days almost all functions of a business entity have been computerized. Corporate operations have been made very easy and convenient through the use of gadgets from the information and technology industry. With the advancement and development in the software market, there is programs and software available for all types of professional work. Similar computerization has been adopted in the Human resource departments as well. Whether it is hiring of a new professional or issues related to pay scale or performance appraisal processes, all have to be carried out through proper computerized procedures. 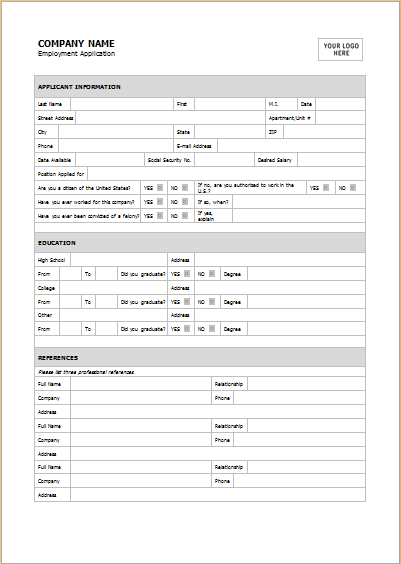 Job application forms are one such element that is used by companies to make their lives easier. Whenever a company is in need of an individual in a department, they will advertise for the appointment in the most appropriate media. The advertisement will contain all the information and criteria needed to apply for the job. All prospective candidates who feel they are eligible for the job are required to fill in a job application form that can be available with the company’s human resource department or can be found on the official website of the corporation. This is a pre drafted document that will help the HR department in gathering the required information and data of the prospective candidate. It will contain questions about name, address, contact numbers, educational credentials, corporate experience if any and employment status along with appropriate references. Many organizations require submission of supporting documents along with the job application form to validate the information provided by the applicant.